Right, I’m just going to come right out and say it: Rattigan doesn’t do much for me. Yes, I know it’s a big year for him and that it’s probably impolite to interrupt the celebration of the great man’s four hundredth’s birthday or whatever, but try as a might to enjoy his work – yes, even The Browning Version – I can’t get past the sense that everything he writes is just awfully, almost wilfully, anachronistic and archaic today. Part of the problem is, of course, me. I am far from the Aunt Edna which he defined (in what Dominic Shellard describes as an “unwittingly catastrophic error”) as his ideal playgoer. You need only read the blogs of our finest national newspapers to hear me described as neither “nice” not “respectable”. “Middle class” is less easy to deny, and I’m certainly growing into the description of “middle-aged”, but few could accuse me of being an “unmarried lady, with time on her hands and money to spend”. Sadly, it seems, I am doomed to never really enjoy Rattigan. You can imagine my chagrin then as the curtain rose to reveal a woman sitting in an armchair in a provincial hotel. Still, it was Sheridan Smith. All was not lost. The plot of Flare Path follows a group of World War II fighter pilots and their wives who all live in a coastal boarding house near an RAF base. There is an upstairs and a bar, but conveniently these are only used for boring conversations – so we get to see most of what goes on in Mr Rattigan’s yarn. Basically, Sienna Miller has decided to leave her husband for an actor (he’s a bad sort) she’s having an affair with. Of course she can’t because her hero husband, quite apart from spending every night over Germany winning the war, is ridiculously lovely and also going a bit loopy, but in an adorably cute way (he’s basically Hugh Grant in Four Weddings but with a charming fear of Messerschmitts). Sheridan Smith (winning the runner up position for best accent of the evening) is married to a Polish pilot (no prizes for who gets first prize) who hates, hates, hates Germans and goes missing for much of the second act. The highlight of the plot is when the pilots go on a difficult, nail-biting mission over enemy territory. Of course, we don’t get to see anything exciting that goes on because Mr Rattigan keeps us stuck in the lobby of a bloody guest house. What we do get to see is a good deal of 1940s style partying, dancing, drinking (I couldn’t help but wonder if the whole secret mission over Germany might have been more straightforward if they weren’t all so completely pissed at the time) and shouting of the word “darling”. And beyond that there’s really very little to report in terms of plot or human interest. No, I tell a lie – at one point one of the wives misses her bus which is a rather exciting and, judging from the guffaws around me, highly comic thing to have happened in the 1940s. Look, the bottom line here is that Flare Path is exactly what you’d expect. Sheridan Smith is very good, Sienna Miller is a bit ropey, the special effects (a red gel over a light and a hifi with an “aircraft explosion” sound effect on cue) are calculated to cost the absolute minimum and the play is a bit creaky. Aunt Edna will love it, but ultimately it remains pretty forgettable. I don’t agree but then each to their own and I did enjoy reading your post. Just call me Rev ‘Edna’ Stan from now on. The evening was delightful, but because of the champagne bar beforehand and the Ivy afterwards. The play – wooden acting against a wooden script. At times it felt more like a pantomime than a play. The set was authentic. But it is stretching too far to think that anyone would leave eggs uneaten in WW2, let alone they would take them outside to bury them. This play deserves to be relegated to amateurs. Oh dear. 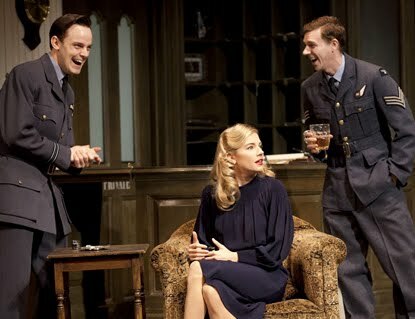 Flare Path is the best play I’ve seen so far this year. Got to disagree with you but your review is funny and I enjoyed reading it. lot faster then most. Can you recommend a good hosting provider at a fair price? I hate my life but at least this makes it bebalrae.